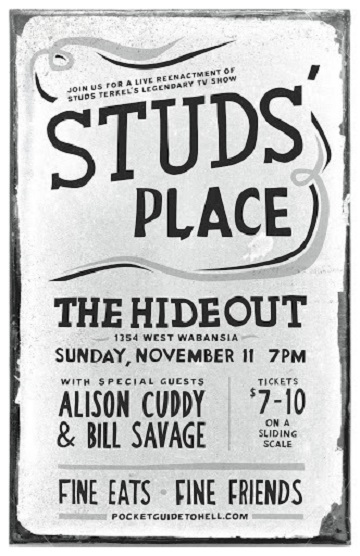 Pocket Guide to Hell presents Studs’ Place, a live performance of a new episode of the classic Studs Terkel television show, at the Hideout (1354 W Wabansia) on Sunday, November 11, 2012, at 7 PM. There is a $7-10 suggested donation. In the early 1950s, broadcaster and oral historian Studs Terkel starred in Studs’ Place, one of the first television shows produced in Chicago. 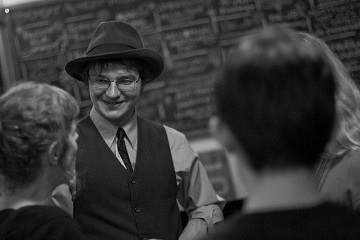 Working from a one-page scenario and with a cast consisting of Chet Roble, Beverly Younger, and future co-founder of the Old Town of School of Folk Music Win Stracke, Terkel largely improvised the episodes, which were all set at the eponymous diner and dealt with everyday life in the city. 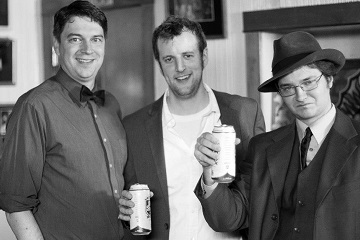 The episodes highlighted the musical talents of Roble and Stracke and served as an inspiration for later Chicago improvisation groups like the Compass Players and Second City. In honor of the yearlong Studs Terkel centennial, Pocket Guide to Hell is producing a new episode of Studs’ Place, set in 2012 but making use of character types and scenarios from the original series. 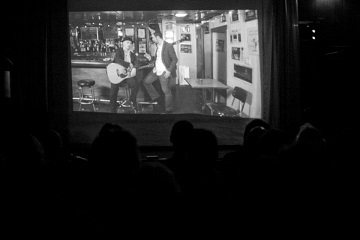 The episode will be performed in the front bar of the Hideout but projected before an audience seated in the back, simulating the effect of watching a live television broadcast. 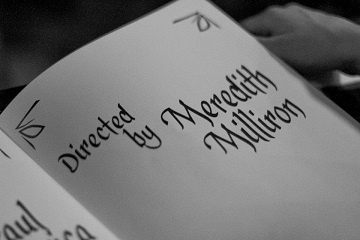 Meredith Milliron (Barrel of Monkeys) directs a cast that includes John Geiger, Roger Payton, Scott M. Priz, Chris Rathjen, Nick Wagner, and Rachel Wilson. Special guest stars include Bill Savage, and Alison Cuddy. The performance will be followed by short talks on the Chicago School of Televsion by the Museum of Broadcast Communication’s Walter Podrazik; on Media Burn’s efforts to restore original episodes of Studs’ Place by Sara Chapman and Tom Weinberg; and on Win Stracke and the founding of the Old Town School of Folk Music by musician Mark Dvorak. Studs’ Place is the first installment of the Chicago Television Project and will be followed in April by Bozo’s Circus. 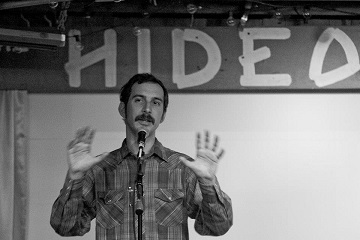 Pocket Guide to Hell is a series of interactive walks, talks, and reenactments dealing with Chicago’s past. Recent events include the Studs Terkel 100th Birthday Party at the Newberry, Behind the Scenes with the Mediums at the Chicago Cultural Center, and The Compass Players Revisited at Jimmy’s Woodlawn Tap.